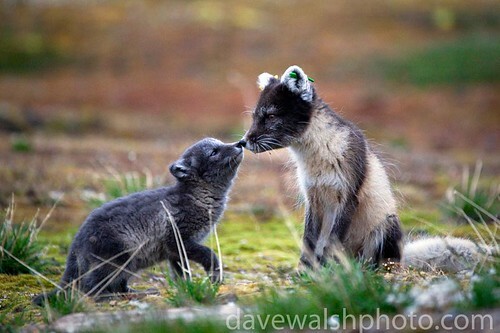 Arctic Fox mother and cub, Ny-Alesund, originally uploaded by Dave Walsh Photography. Arctic Fox mother and cub, Ny-Alesund, Alopex lagopus, living under the &”London Houses” – the Dutch research station at the international research base at Ny-Alesund, Svalbard. The mother had lost her white winter coat in the preceding weeks – those are id-tags on her ears, as she’s a known character in the area!